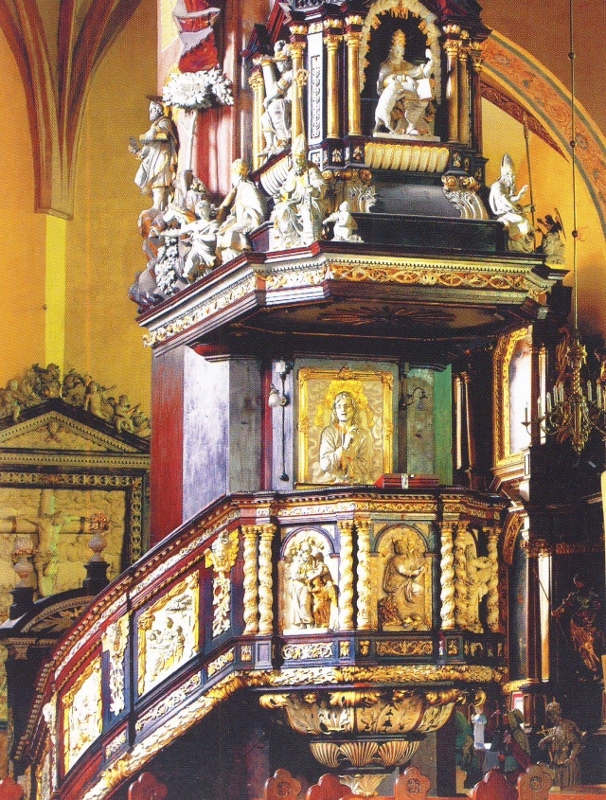 The pulpit dates from year 1698. 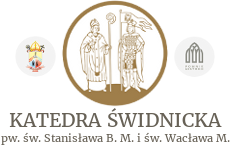 It is the work of Johann Riedel, Jesuit from Świdnica and eminent sculptor from Silesia Opava. The first sermon was delivcred July 31,1698, on the day ofthe liturgical feast of St. Ignatius of Loyola, the founder ofthe Jesuit order. Notę Jesuit motto: AMDG (Ad Maiora Dei Gloriam – To the greater glory of God) above the pulpit grate. On the rail-ing of the stairs you will find panels of bas-reliefs depicting the divine virtues: faith, hope and love – Caritas. The pulpit is richly decorated. In the arcade panels arę images of the four Evangelists attributes: St. Matthew with an angel, St. Mark with a lion, St. Lukę with the ox and the board on which hę paints and St. John with an eagle. In the back of the pulpit, there is a bas-relief of a torso of Jesus blessing peo-ple. The decorative frame reveals the letters “I”, “H”, “S” (IHS), the abbreviation ofthe name of Jesus. In the canopy, therc is image of a dove symbolizing the Holy Ghost. Canopy is in the form of Tempietto with a gallery. On the steps of tempietta sit Doctors ofthe Church: St. Gregory the Great-pope with a dove, St. Ambrose bishop with a child who hailed him Bishop of Milan, St. Augustine with a crosier, and St. Jerome presented as a hermit with a book of Scripture, which hc translated from the original languages into Latin (Yulgate), with a skuli and – symbol of asceticism and the lion – hę pulled the thorns from the legs of the lion and bandaged his wound. The doctors of the Church arę accompanied by angels that herald the presence of God. Above the Doctors of the Church allegories arę represented: The powcr of God which supports the column, a symbol of strength and courage, stability and durability, the allegory ofthe Catholic Church teachings – a lamb leaning on the book. There is also allegory of God’s Wisdom with a torch. The composition ofthe pulpit is crowned by a figurę of an angel with trumpet. Above the pulpit towers the figurę of God the Father – King of the universe wearing a crown, holding the scepter and the globe. And below you will find symbol of the Holy Spirit in radiant glory.